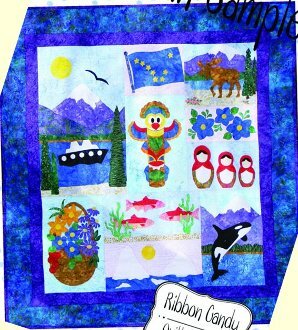 Alaskan Sampler wall quilt is the perfect keepsake for you or a friend. Showing the images from ports of Juneau, Sitka, Ketchikan, Glacier Bay and Victoria BC. This will be a great reminder of your cruise. All images are appliqued using fusible webbing. All templates are full size and ready to be used. The quilt finishes 48" x 52". Make the whole quilt or use the individual blocks to make smaller wall hangings or pillows.